International Jew's Harp Society member Nguyen Duc Minh talks about his passion for the rare instrument. The Jew's harp, or mouth harp, or jaw harp, consists of a flexible metal or bamboo tongue or reed attached to a frame. The tongue/reed is placed in the performer's mouth and plucked with the finger. Viet Nam's only professional Jews harpist Nguyen Duc Minh won the title of Best Jews Harpist at an international festival in Holland in 2006. He has also toured Sweden, France and Spain. As a young Hanoian bamboo flute player, why did you turn to the Jew's harp? During my first days at the Ha Noi Conservatory of Music, I was astonished by the subtle sound of the Jew's harp and felt the urge to study it. However, I was disappointed after digging through the whole conservatory to find only a few pages of music and ancient pictures of the Jew's harp. I was discouraged but a friend gave me a Jew's harp. Looking at that small musical instrument, I realised I had found my passion and my path. How have you pursued your passion? 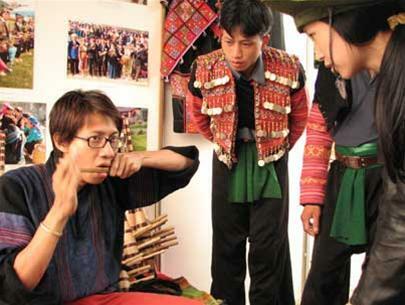 I visited the villages of ethnic groups in the northern mountains, such as the Pu Tin, Mu Khuong and Co Ma, where they allowed me to study the mouth harp. The instrument is close to the languages of the people and, while the method of playing varies with different groups, its still a means of sending love messages among young couples. The melodies transmit the players affection. After six years hiking to remote mountain villages, my feet have become calloused and at times they bled, but I have acquired precious skills: to be able to play five of 10 kinds of Vietnamese mouth harp. Living in the area considered as the home of the Jew's harp you had the passion to yourself. I was worried when I found out the Jew's harp had been taken into account in only two documents preserved in the National Academy of Music. In the last two years, I have collected many different harps. On my trips to the Central Highlands or to the central province of Nghe An, I found Jew's harps made from iron; in Hue I collected bamboo harps; in the northern provinces I found mainly bronze ones. With such a collection and knowledge of the different styles of playing, I feel really confident as I totter along this lonely road. You are the first Vietnamese to become a member of the International Jew's Harp Society. Tell me more about it. On my visit to Holland I was admitted to the society, maybe because to my passion for the sound of the Jew's harp and a desire to preserve the form. I then attended exhibitions of Jews harps in France and collected harps from different countries. It made me realise the abundance and attractiveness of this wild but colourful instrument. I play the Jew's harp in a jazz-like style, or in other words, a modern way. I was acknowledged as one of the four best Jew's harpists among about 200 participants from 33 countries at the festival in Holland. I believe I have confirmed the status of Viet Nam in the international forum of Jew's harpists, to some extent. How can a single reed instrument produce so many sounds, especially when it is made of different materials like bronze or iron? You will hear the mouth harp in national concerts in Viet Nam producing sounds of the mountains and forest and of the ethnic people. Despite having only one string and one musical note, the harp gives up many sounds and rhythms so listeners dont get bored. Changing rhythms and sounds produced by the mouth adds to the variations. Despite being a traditional instrument, the harp can be made to sound modern. Vietnamese harps have high and wide sounds, unlike the low and opaque sounds of western counterparts. Various types of harps have different methods of playing, using lips, lips and teeth, and strings, producing distinctive sounds. Inner Sanctum: You have talked of using the mouth harp as a means of integration. So what have you done to encourage the world to pay more attention to the instrument? After the festival, I stayed in Holland for a couple of days to introduce Vietnamese cultural features to other nationalities and perform voluntarily at homes for the aged and in cultural centres. I have received many emails inquiring about Jew's harps and inviting me to perform but I have been busy studying. Meanwhile, my band, Hon Tre, and I will combine different musical instruments like monochord, two-chord fiddle and 36-chord zither to introduce the music to young people. Understanding the techniques set by International Jew's Harp Society and from my experience of the original methods of playing in Viet Nam, I will write a book about the Vietnamese mouth harp, enclosed with a CD. Afterwards, I will study further the methods of playing of Mong, Ede, Giarai ethnic peoples. Im also thinking about using mouth harps to compose music for Viet Nam water puppetry. The sounds of harp are rich in imagery and so is water puppetry. It would be a wonderful combination full of national character. I am also looking forward to an international festival of Jew's harps being held in Viet Nam. By then, Viet Nam will be better known as a cradle of the mouth harp, which Vietnamese themselves have forgotten to confirm in the international arena for a long time.